This camp is a “can’t miss” for both skilled players and new players to the game! Campers will be split up by skill level and age in order to provide a unique experience for all. Beginning players will learn and practice skills through fun drills, as well as games, under the direction of high-level college coaches. 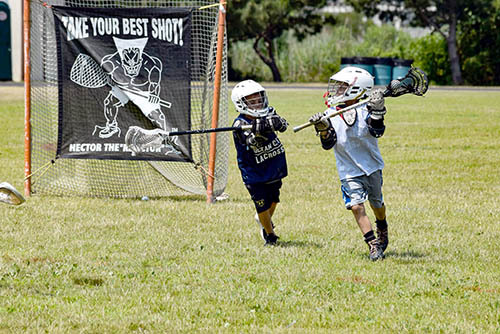 Advanced players will be given detailed instruction on many of the games’ intricacies while applying these lessons and drills during game play. Coach Jim Berkman and his staff will help participants develop and refine their skills in shooting, passing, cradling, and much more! Participants will also compete in individual contests and daily game play. TIMES: 10:00 a.m. – 3:00 p.m.
CAMP EXTRAS: Camp jersey, certificate of completion and giveaways. CAMPER NOTES: A non-perishable lunch should be packed Monday through Thursday; pizza party on Friday. Equipment can be borrowed for those who do not have their own. Indoor shoes are needed in case of inclement weather.